The more you trust God, the easier it will be to obey Him. The following scriptures were discussed and are recommended for a bible study. Proverbs 15:3 You can't hide from God. Our God is loving and forgiving. Jeremiah 7:21-23 God led His children out of Egypt. His command was that they love and obey Him. Jeremiah 7:24-28 Israel did not listen and obey. They did not love the truth. It happened then and it is happening now. This is a broad topic. I won't ever be able to discuss every detail. But Yahweh willing, here we will hit on the important aspects. Perhaps anyone who hears this will stop blaming God for our woes. In modern times when we have floods and drought, when we have pestilence and disease, very few people who are affected by these things ever even consider what manner of sin they have committed, or what manner of sin they have allowed to exist in their communities, that they should suffer such things. But as our ancient ancestors believed, when such calamities befall us, they are clearly punishments from Yahweh our God. The proof that such a concept was prevalent even in relatively recent times is found in the very origin of the word that is used to describe such calamities, which is crisis. In English, a crisis is a time of danger or trouble. But in Greek the word is decision or judgment, and in our Scriptures it describes the judgment of God. While modern secularized dictionaries attempt to obfuscate this connection, it is the true origin of the modern English use of the word. The following scriptures were discussed and are recommended for a bible study. Genesis 2:7 And the LORD God formed man (Adam) of the dust of the ground, and breathed into his nostrils the breath (spirit) of life; and man became a living (spirit) soul. The following scriptures were discussed and are highly recommended for a bible study. Romans 12:1-3 Change your way of thinking. Be a humble servant. Cleanse yourself of the garbage the world feeds us. Romans 12:19-21 This verse has a second witness: Leviticus 19:18. This has to do with a brethren, not the enemies of God and our people. We are not to serve the enemies of God. Ephesians 5:21-26 Change your way of thinking. Colossians 3:1-10 Kill the Old Man! The old man is the spiritual condition of a worldly man. James 1:1-8 Tribulation works patience. Count it all joy. it's something that God has to do. The world watches how we endure hard times. James 1:12-15 When you get tempted, you either get better or bitter. The world wants you bitter. God needs better and stronger Christians. You will be blessed. A message of inspiration to you to give God your time and to study the Scriptures. This visit to the Fellowship of God's Covenant People was decided on relatively short notice, and when I considered what I should present, I thought to speak on this subject of scattering and gathering upon being informed of certain events which took place recently here in this congregation. When I discussed my planned talk with Pastor Downey, he informed me that he himself had already said some of the same things which you may hear from me today. Mark even quoted from an essay on this topic which I had written a few years ago, and which I will incorporate into this discussion. So when Mark asked me if I wanted to read what he had written, I politely declined, explaining that if I said the same things independently, that would better serve as a second witness to what he has already said here over the past few weeks. In my opinion, if we really do seek to please Christ and edify the body of Christ, we cannot entertain those who despise our core message. We cannot entertain those who in any way work contrary to our core message. None of the things which I say here today are for your admonishment. Rather, I would commend you for supporting Pastor Downey in his decision. Therefore I hope to say these things for your edification, that you have another assurance, knowing that you have made a necessary decision. I pray you continue to make such decisions in the future, because we should always expect that our faith may be tried in the fire. Read more about How Much Do You Love Truth? God's Way versus the world's way. God chose the elect of Israel and that is why we are different. Love not the world. The world will try to pull you into its sin, including pulling you away from God's law and His covenant and rejoices when even one person falls away from the covenant. Get off the fence and quit wrestling with God. Your body is a temple to God and it is NOT yours! Read the Bible and examine yourselves. Truth only works if you accept it. Grow in God. Open your Bible, read it and KNOW it. God knows that you will stumble, but He will correct you. Ensure that you are clothed in white because the wedding garment is a sign of purity and is CRITICAL to God. White is the ONLY acceptable color of the wedding garment. God did not divorce the world, but only the 10 Tribes of the House of Israel. God will remarry ONLY the Covenant people. Gold has to be tested with fire. The hotter the fire, the more impurities are burned away. Our Father loves you. Be an overcomer. God's timing in your life is perfect. 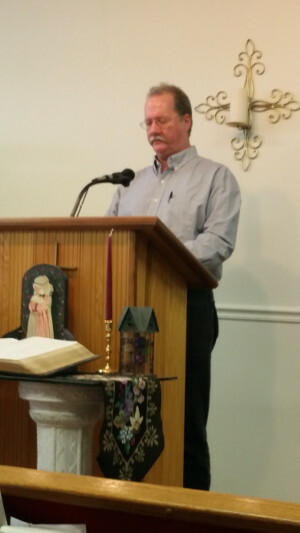 William Finck of Christogenea.org spoke at the Fellowship of God's Covenant People this Sunday June 21st. This presentation is really a compendium of things I have done presented over the past several years. If one has read or heard my commentaries on the minor prophets, and the recently completed Romans exegesis, all of these things will be familiar, while I hope to have added a new perspective or two. This is because the grounds for Christian communion do not change, and the lines where Christian unity and divisions are drawn should indeed be very clear. Yet I find many Identity Christians who do not understand them, so I continually reiterate these same messages, and in as many ways as I can. Christians are raised wondering whether they will be accepted by God at the end of their lives. With this, perpetual doubt is sown which causes men to turn away from the interests of their community and their race, in favor of their own interests whereby they pursue the materialistic desires of the flesh. When they face difficult times they feel abandoned by God, and because they have doubt it is just as easy for them to abandon God. By abandoning God, they are of no use to their communities and instead they work against the interest of their kinsmen because they seek to fulfill their own material needs at the expense of the needs of the community. Become new in Christ and put away the old man. All things will be new! But know that you can resurrect the old man at any time and work to stay away from those things that will tempt you. Read more about Do You Remember Your Funeral? Judges 13:1-5 Samson is chosen to be a deliverer of Israel out of the hands of the Philistines. Judges 14:5-9 Samson killed a lion. Later Samson found honey in the body of the lion, for bees had made their comb there. He took the honey out of the carcass and also gave some honey to his parents, even though he wasn't supposed to touch the carcass. Judges 14:10-18 Samson gives the Philistine men a riddle which they couldn't answer. The Philistine men went to Samson's Philistine wife to find out the answer. Dr. Ramsey is remembered for his church in Nebraska being America’s first padlocked church for courageously refusing to bow to the government demand that he license their church school. He went to federal prison for standing his ground on Christian principles. He is also known for his super conferences and the Court of Divine Justice. Pastor Everett is a well known and respected Christian Identity author and speaker. Click here to visit his website.